If you are thinking of throwing out Heerekayi sippe/Ridge gourd peel/Turai ka chilka, please don’t do that, here is a tasty, hot and tangy chutney from heerekayi sippe. Varieties of chutneys can be prepared with Ridge gourd peel using different ingredients in different styles. Ridge gourd Peel is called heerekayi Sippe in Kannada, Turai ka Chilka in Hindi and by different names in different regions in India. I am preparing this dish using ridge gourd peel and split bengal gram (Kadalibele or Chana dal). You can serve it with rotis, chapatis, parathas, upama and all types of rice. You can use it as bread spread as well. You can prepare another side dish from inner part of ridge gourd which is left over after peeling it off, may be dal or subzi or any other side dish. It will be a wise decision if you use ridge gourd peel in your regular diet as it is rich in fiber, minerals and vitamins. It is an ideal diet for those who are weight conscious. You will be happy to know that a very less quantity of oil is used and no fatty content like nuts are used while preparing this dish. Most importantly, it consumes very less time and easy to prepare, no need to worry about spoiling of the dish and very less number of ingredients. Just cook it and grind it to your requirement of texture of the chutney. Let’s see the preparation of Heerekayi sippe chutney with kadalibele. Take a big container, pour warm water in it. Add 1 tea spoon of salt to it and dip ridge gourd in it. Leave ridge gourds in warm water for 5 minutes. Germs or mud or any unwanted particles over ridge gourd skin will come out and skin gets cleaned. Take out and wash them in running plane water. 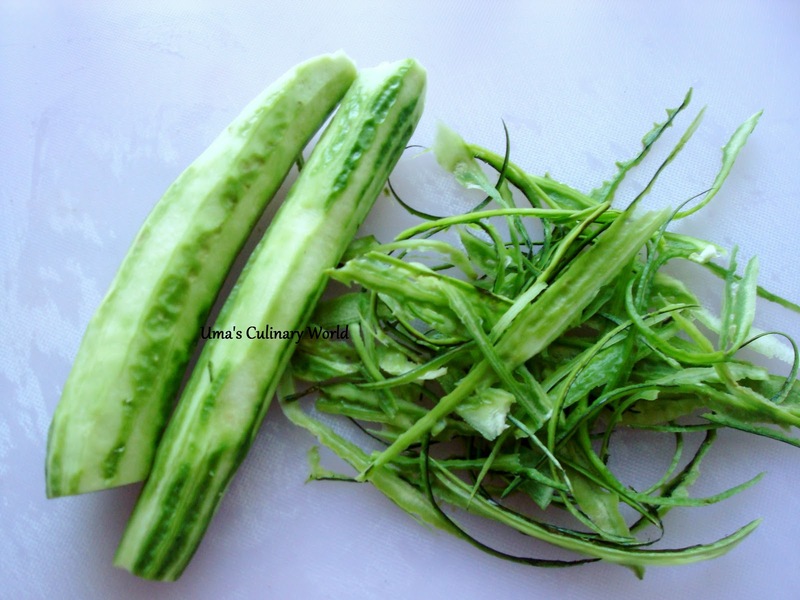 Before peeling off the skin, taste the ridge gourd with skin by cutting the edge of it. Sometimes they taste bitter. If it tastes bitter, then don’t use it for chutney, otherwise taste of the chutney will be bitter. After tasting all the ridge gourds, peel off the skin and chop the peel into small pieces and keep it aside in a bowl. Heat a frying pan on medium flame, pour 1 tea spoon oil to it. Add fenugreek seeds and split bengal gram to it and roast them together with the help of a spoon until they turn into golden brown color or until they start leaving an aroma. It may take hardly 3 minutes. Add red chillies to it and roast them together continuously for 1 or 2 monutes. Add chopped ridge gourd peel and toss them well. Close the pan with lid. Allow it to cook for 3-4 minutes on low flame. Remove the lid and check whether the peel is softened. If Peel is softened, it means it is cooked properly, otherwise cook it further for 2-3 minutes by closing the lid. Open the lid, add tamarind pulp and toss the stuff and sprinkle one table spoon of water over it and close the lid. Cook it further for 2 minutes and remove the pan from heat. Allow it to cool down. It may take 10 minutes. Mean while you can prepare seasoning/Voggarane/Tadka. Heat a small frying pan on medium flame, pour remaining oil to it. Add mustard seeds, wait until they split, add cumin seeds and hing to it, remove it from heat immediately and keep it aside. When mustard seeds start splitting, it means temperature of oil is very high, whereas cumin seeds require very less heat to split. If you leave it on heat after adding cumin seeds, the whole seasoning may get spoiled. Take a mixer jar, pour the stuff to it, add salt and 1/2 cup of water to it. Run the grinder for 1 or 2 minutes, open the lid of jar, mix the stuff with the help of a spoon and add another 1/2 cup of water and grind it further. Paste should be coarse as it enhances the taste and texture of the chutney. Take it out to a bowl, pour seasoning over it and toss it. You can store it in refrigerator for 2-3 days. Tasty, hot and tangy Heerekayi sippe chutney with kadalibele is ready to serve. Isn’t it easy!